Will Piers Morgan ever become humble? 1) Posh to win the League One play-off final at Wembley. 2) Arsenal to win the Premier League. 3) Australia to lose every cricket match they play. 4) Northampton to lose the League Two play-off final at Wembley, to a last-minute own goal. 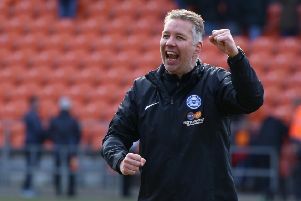 5) Posh to win at Preston in an FA Cup replay just to see Graham Westley’s reaction. 6) Kevin Pietersen and his number one fanboy Piers Morgan to become genuinely humble. 7) Rory McIlroy to win the Masters and return to the number one spot in the world. 8) Tiger Woods to retire. 9) The BBC to stop pretending enough people care about ladies team sports. 10) Andy Murray to win the Australian, of the French, Open.